Determined Japanese banzai charges made a deep impression on the U.S. Marines who faced them and on their superiors back in the United States as well. While the mad bayonet charge represented only a tiny fraction of Japanese tactical doctrine, official reports and anecdotal lore drew a picture of a crazed and unstoppable rush of sword-waving madmen eager to die for their Emperor and, if possible, take a few enemies with them. The answer to the Japanese bayonet charge, Marine leaders concluded, was firepower. Lots and lots of infantry firepower. Having experimented with different tactical organizations (squad, platoon and company) since the end of the Great War, a few more re-writes to the Table of Organization didn’t bother the Marine leadership. At some point, they believed, they would find the perfect solution to maximize firepower and tactical flexibility. When the Marine Corps went to war in the late summer of 1942, the Marine Rifle platoon numbered 42 men, divided into three rifle squads and one automatic weapons squad. The automatic weapons squad had two Browning Automatic Rifles, while the rifle squads had one each. The BAR had been issued at the very end of the First World War and made an enormous impression. Though used in place of a light machine gun, it lacked the capability for truly sustained fire (only a 20-round magazine, and no capability to easily change barrels once it got hot). But the Marines liked it very much, and it remained in use through the Korean War. All other riflemen carried the M1903 Springfield bolt-action rifle. The U.S. Army had priority for deliveries of the new M1 Garand semi-automatic rifle, leaving the Marines with the same weapon their fathers took to Belleau Wood in 1918. Squad leaders and a few others were issued the M50 Riesing submachine gun, as the Army had priority for the much more reliable Thompson. The M50 proved particularly vulnerable to jamming in sandy conditions, something found on many Pacific islands. Those carrying the weapon usually threw it away and picked up something else from the battlefield. A new rifle platoon scheme appeared in 1943, with three rifle squads each with 12 men, with two Browning Automatic Rifles per squad and every other Marine now toting the M1 Garand semi-automatic rifle. This gave the Marines much greater firepower, but not the flexibility they still sought. By the time of the Saipan landings in June 1944, battle experience had brought a massive reorganization to the Marine Rifle platoon. Numbers went up only slightly, to 46 men, but now the platoon had three squads, each in turn split into three four-man fire teams. Each fire team was built around a Browning Automatic Rifle, with the other riflemen carrying M1 Garands. This represented an enormous increase in firepower, but that wasn’t all. Each squad also received a flamethrower and a demolition kit. Despite the large proportion of leaders, the fire team concept placed a tremendous burden on the sergeant leading the rifle squad, but the Marines believed they had a sufficient quality and quantity of NCO’s to make the scheme work. The Marine generals decided that they had now found their perfect squad, and kept the 13-man squad as their standard for decades afterwards. While flexible, it demanded a comparatively huge commitment of trained, motivated non-commissioned officers: three corporals to lead the fire teams, and a sergeant to direct them. The platoon required, at full strength, 15 NCO’s and one officer; by comparison, the German grenadier platoon of 33 men had either seven NCO’s or six NCO’s and one officer. Marine machine gun platoons saw a matching increase in their firepower. The 1942 machine gun platoon had four Browning M1917 heavy machine guns; .50-caliber machine guns provided to the Weapons Company’s anti-aircraft platoon to fend off enemy planes often turned up in the firing line as well. By 1944, the separate Weapons Company had disappeared and each Rifle Company now had its own machine gun platoon, officially armed with six M1917 light machine guns and six more M1919 heavy machine guns held “in storage.” Being Marines, most platoons simply halved the machine gun crews and put all 12 weapons into operation. That made for a unit of limited mobility with massive firepower and the ammunition usage to go with it. In the very earliest printings of Panzer Grenadier: Saipan 1944, we gave the Marine Rifle platoon an enormous direct fire rating of 10, making it the most powerful infantry unit in the game series (the Soviets have some AK-armed infantry in Hammer & Sickle with the same firepower rating, but they have a shorter range). That’s probably a little too much, and later printings pulled that back to a mere 8: still the most powerful infantry unit in the World War II period, but not quite as impossible for the Japanese to overcome in assault combat (now they’re “only” outgunned by 2:1, which seems more reasonable). Unit ratings in Panzer Grenadier reflect more than just rifle counting, though rifle counting’s pretty important since other factors can be represented through morale and the mix of leaders provided. The 1944 Marine Rifle platoon is an outstanding organization, and the piece’s rating reflects that as well as the relatively huge number of automatic weapons. We have a small sheet of new Marine Rifle pieces to replace those in Saipan 1944 if you run across one of those rare early printings (Marine vets can just keep the super-powered ones in use). You can download the new Marine Rifle pieces right here. 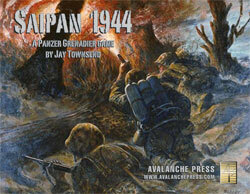 Saipan 1944 is here! Click here to order!